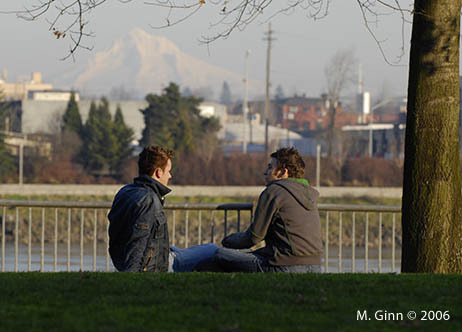 Two Portlanders enjoy the sunshine in Tom McCall Waterfront Park downtown on January 23. My first full day in Portland (Dec. 17, 2005) was the first day of a wet spell in which the city recorded measureable rainfall in 31 of 32 consecutive days. January 23 was the first really sunny, warm day, and Portlanders were out in droves to enjoy it. Mt. Hood is visible in the background. While winters in the Northwest are known to be grey and rainy, it doesn’t seem to pour that oftenâ€”most of the time we just get drizzle or light rain on and off all day long.